Participants in Conference of Presidents Leadership Mission to Israel tour Israel’s F-35 fighter squadron and Gaza border. Participants in the 45th annual Conference of Presidents Leadership Mission to Israel, led by Chairman Arthur Stark and Executive Vice President/CEO Malcolm Hoenlein, toured Israel’s F-35 fighter squadron and the Gaza border as part of a first-hand look at security threats the country is facing, and the IDF’s readiness to confront them. 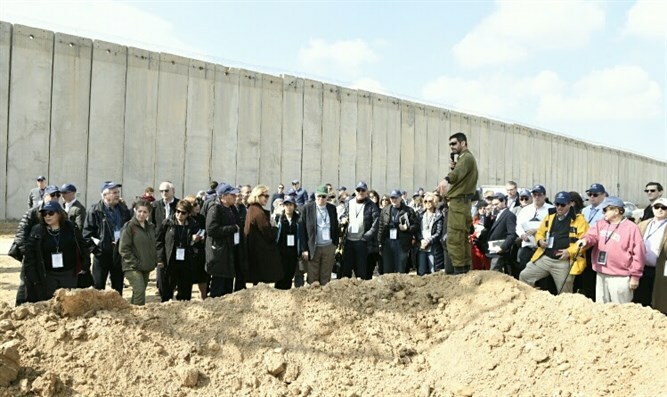 The group began with the first-ever visit by a foreign group to see construction on the barrier Israel is sinking deep into the ground along its border with the Gaza Strip. Mission participants received a detailed briefing on the threat posed by Hamas tunnels dug to cross into Israel, and the methods being used to prevent this. They also watched some of the heavy machinery in action. The Deputy Commander of the IDF’s Gaza Division gave the group a strategic overview at the divisional headquarters near the border. Among other security topics, he spoke of the ongoing unrest at the border fence, explaining that more than half of the Palestinians killed since the violence began last May had been Hamas members. “This a war. This is not a riot. This not the ‘yellow vests,’” he said, referring to the violent social protests taking place lately in France. The Deputy Division Commander also spoke of the 2.1 million people in the Gaza Strip, as well as the schools and universities they have. Delegates then went to the Nevatim air base near Arad for a briefing by the base commander, Israel Air Force Brigadier-General Eyal Grinboim, and Lieutenant-Colonel Richard Hect, head of the Air Force’s International Affairs Branch. Hect explained that the IAF’s job was to prevent an all-out conflagration in what he referred to as a “campaign between wars.” He also spoke of ongoing military cooperation and joint training exercises with other air forces, including those of the US, the UK, Germany, Cyprus and Greece, to name just a few. He added that Israel had been the first country outside the US to take direct delivery of the F-35, an ultra-sophisticated, American-built combat aircraft that is the newest in the IAF’s arsenal. The Nevatim base is now home to those jets. The participants were the first foreign group to visit the F-35 squadron. They received a briefing by Major M., the squadron’s executive officer, and got an up-close look at the stealth jet – witnessing in the process a thunderous take-off by two of the aircraft. The previous evening, the mission participants heard fascinating presentations by five members of the Knesset’s Foreign Affairs and Defense Committee, including its chairman, MK Avi Dichter (Likud). He also spoke forcefully about another Hamas tactic. “They are building their underground tunnels, but they are also building their underground cemeteries,” he stated. Last to speak was MK Nachman Shai (Labor), who focused on the role of Diaspora Jews in Israel’s affairs.